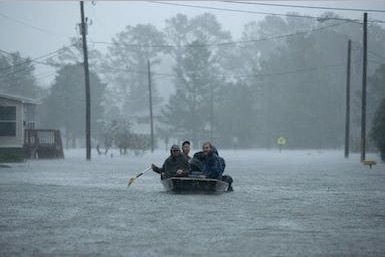 STORM DUMPS 18 TRILLION GALLONS OF WATER (Friday Church News Notes, September 21, 2018, www.wayoflife.org, fbns@wayoflife.org, 866-295-4143) - Hurricane Florence, which made landfall in North Carolina on September 14, had dumped 18 trillion gallons of water by September 16. “That’s enough to fill the Chesapeake Bay or cover the entire state of Texas with nearly 4 inches of water” (“Florence aftermath,” FoxNews, Sep. 16, 2018). In April 2018, 50 inches of rain fell in a 24 hour period on the Hawaiian island of Kauai. In January 1966, 1.825 meters (6 feet or 71.8 inches) of rain fell in 24 hours in Foc-Foc, La Réunion, an island in the southern Indian Ocean. That was equal to 7.5 tons of rain per acre. These were localized storms of brief endurance. The flood of Noah’s day involved the breaking up of the fountains of the deep and a global deluge of rainfall for 40 days and nights straight (Ge. 7:11-12). Two excellent books on the global flood are In the Beginning: Compelling Evidence for Creation and the Flood by Walt Brown and Earth’s Catastrophic Past by Andrew Snelling. These men have Ph.D.s in the earth sciences. TRAVIS CLARK ROCKING OUT (Friday Church News Notes, September 21, 2018, www.wayoflife.org, fbns@wayoflife.org, 866-295-4143) - In March 2017, we published “A Plea to the Clark Family” about the contemporary direction of the music and philosophy of the Clarks of Solid Rock Baptist Church in Berlin, New Jersey. The plea was public, because their music and ministry is public and influential far beyond their local church. The Clark Family music used to be a simple bluegrass-tinged style, but it is moving far beyond that, and a drift like this has no bottom. We have seen it time and time again. I see this progression everywhere among those who love Southern Gospel. Important lines are being erased. One reason is that even a little Southern Gospel creates an appetite for jazzed-up rhythms and sensual vocal styles (e.g., scooping, sliding, breathiness, improvisation, vocal rasping). Another reason is that the vast majority of Southern Gospel singers have moved into the “progressive/contemporary” sphere, probably because that is where the real money and prestige is, and even the most conservative people are being influenced by the contemporary Southern Gospel crowd because they are letting the guard down and aren’t being careful enough about biblical separation. After listening to many examples of the Clark Family music, it became obvious that they are performing a lot of music from the world of contemporary Southern Gospel. They are building bridges to contemporary people the likes of Brian Free, Ricky Free, Jeremy Johnson, Joel Lindsay, Tony Wood, Mike Schultz, Jody McBrayer, and Billy and Cynthia Foote. There isn’t any serious difference between the world of contemporary worship music represented by the Newsboys and Chris Tomlin and Hillsong and the world of contemporary Southern Gospel represented by Brian Free, etc. It is all fleshly music that gets people emotionally addicted to the world’s music. And like all addictions, it is never satisfied. Further, the world of contemporary Southern Gospel is as ecumenical as the world of CCM. All of the people in contemporary Southern Gospel hold a “judge not, loosen up and don’t be so strict” philosophy of Christianity. Contemporary Southern Gospel yokes church people into association with the likes of the Gaithers and the National Quartet Convention, and a more radically ecumenical crowd does not exist. They preach a “let’s all get together and not judge” message. Recently Travis Clark teamed up with Mark Rasmussen, a graduate of West Coast Baptist College and a former prominent member of the Lancaster Baptist Church (Lancaster, California) music program, to produce a Christian rock song called “Chain Breaker.” The video is found on YouTube HERE. THE NEW INDEPENDENT FUNDAMENTAL BAPTIST MOVEMENT (Friday Church News Notes, September 21, 2018, www.wayoflife.org, fbns@wayoflife.org, 866-295-4143) - The New Fundamental Independent Baptist Movement (The New IFB) is a loose fellowship of Independent Baptist churches that are committed to a slew of heresies, including Replacement Theology, Pre-wrath Rapture, and no-repentance Quick Prayerism. There is a strong association with Steven Anderson, who is featured prominently at www.thenewifb.com and The New IFB Twitter page - https://twitter.com/thenewifb?lang=en. One of the videos posted there is of Anderson preaching that “9/11 Was an Inside Job.” For more on this see What About Steven Anderson?, which is available as a free eBook from www.wayoflife.org. IN BETWEENITES (Friday Church News Notes, September 21, 2018, www.wayoflife.org, fbns@wayoflife.org, 866-295-4143) - James Henley Thornwell was a staunch Old School Presbyterian preacher who fought against theological modernism in the 19th century. The sixth president of South Carolina College (today the University of South Carolina), Thornwell was weary with the “in betweenites” of his day who said they loved the truth but were soft in their stance and refused to boldly withstand error. “To employ soft words and honeyed phrases in discussing questions of everlasting importance; to deal with errors that strike at the foundations of all human hope as if they were harmless and venial mistakes; to bless where God disapproves, and to make apologies where He calls us to stand up like men and assert, though it may be the aptest method of securing popular applause in a sophistical age, is cruelty to man and treachery to Heaven. Those who on such subjects attach more importance to the rules of courtesy than they do to the measures of truth do not defend the citadel, but betray it into the hands of its enemies. LOVE FOR CHRIST, AND FOR THE SOULS FOR WHOM HE DIED, WILL BE THE EXACT MEASURE OF OUR ZEAL IN EXPOSING THE DANGERS BY WHICH MEN’S SOULS ARE ENSNARED” (quoted in a sermon by George Sayles Bishop, author of The Doctrines of Grace and Kindred Themes, 1910).